Island Villa 3363 a petite jewel in the Thousand Islands, a collection of tropical islands in the Java Sea near Jakarta. 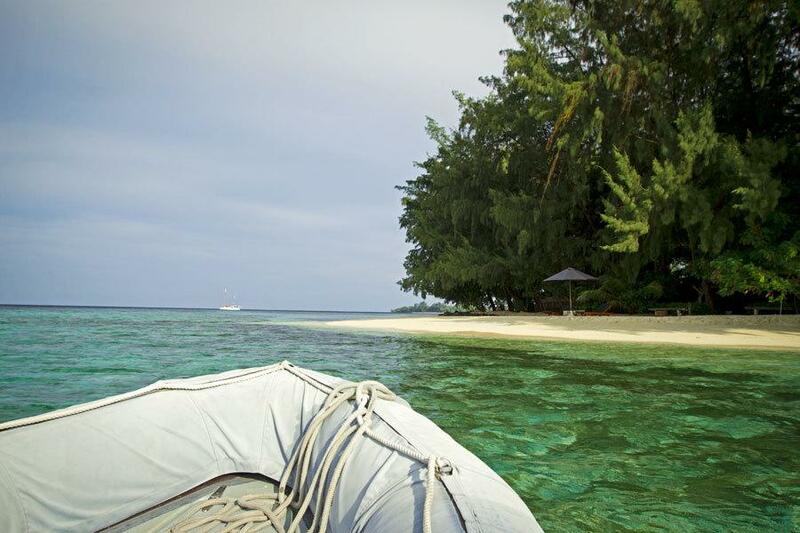 The island is approximately one hectare in size, with two pristine white sand beaches. At an easy pace, one can walk its perimeter in less than fifteen minutes. There are four houses dotted around the island, enhancing the feeling of absolute privacy and serenity. 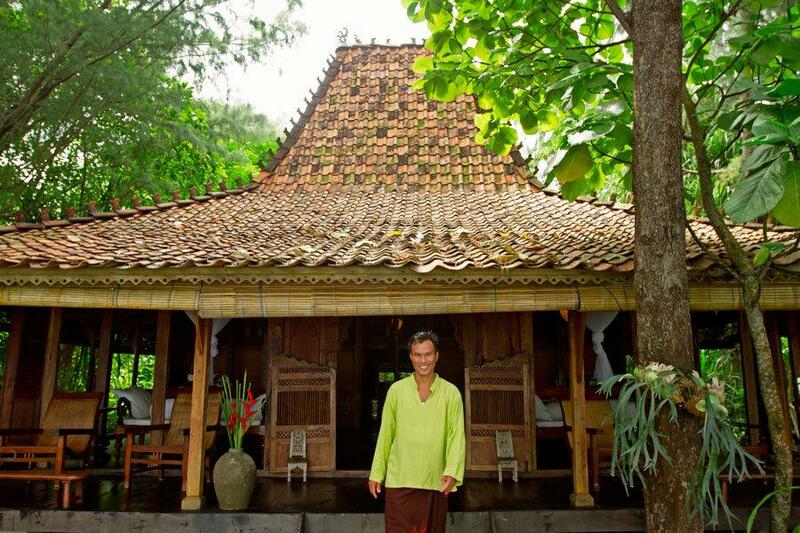 The main Joglo houses a large living and dining pavilion, two master suites and two bathrooms. The Malay style guesthouse includes a master suite with an adjacent bathroom and the Balinese Lumbung has a double bed and separate toilet and shower area. There is a fantastic freestanding pavilion to convene at for dinner and drinks. Whether you're aim to unwind and relax back with a good book or you'd like to explore your surroundings, Island Villa 3363 has something to appeal to everyone. Water activities include waterskiing, kayaking to neighboring islands, snorkeling, Scuba Diving and fishing. 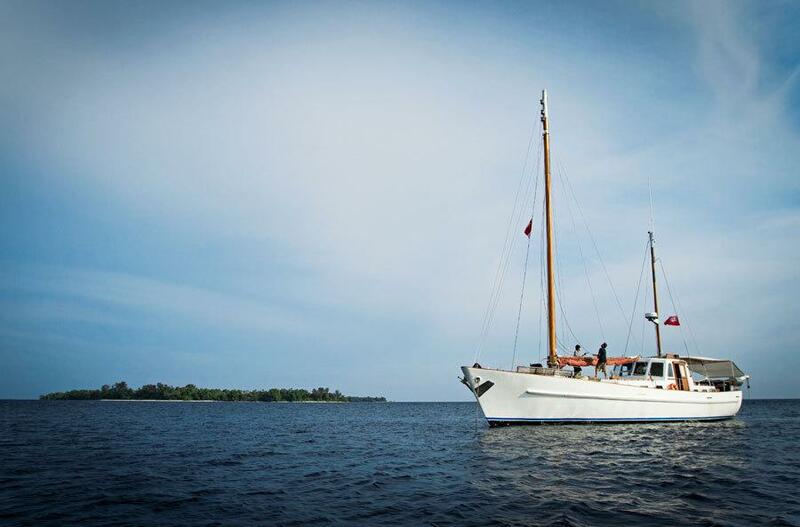 If you're transferring from Jakarta onboard our vintage motor sailing yacht ‘The Raden Mas', you might also like to tour the islands for a day or enjoy a starlit barbeque onboard. Guests have been known to fall asleep on deck under the canopy of twinkling stars! Island Villa 3363 is set amidst Indonesia's Thousand Islands (Pulau Seribu), a collection of stunning tropical islands in the Java Sea near to Jakarta. 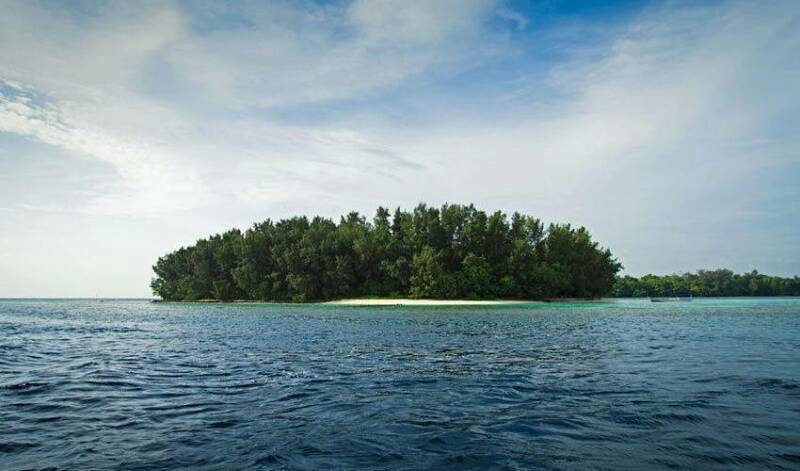 Despite it's name, The Thousand Islands comprise approximately 130 small islands surrounded by a National Marine Park and hundreds of coral reefs! 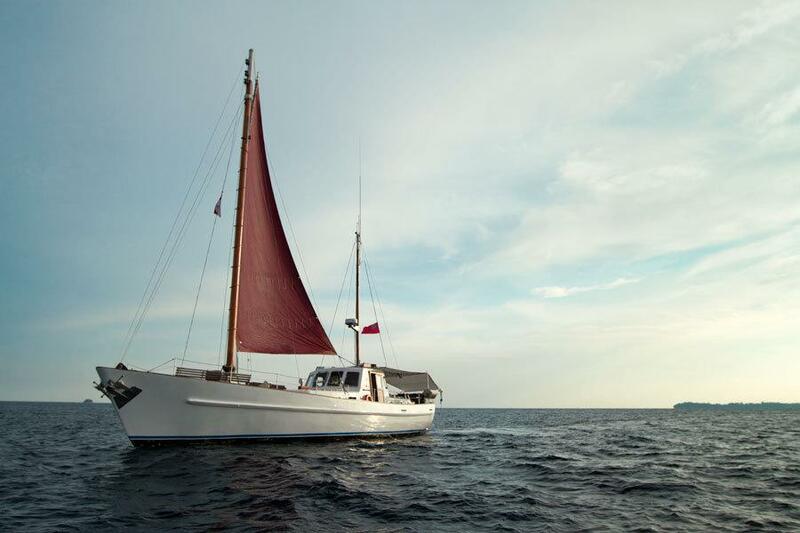 Approximately forty miles offshore, Island Villa 3363 is a beautiful petite jewel in the Java Sea reachable via a leisurely cruise onboard our vintage motor sailing yacht the ‘Raden Mas'. Speedboat or Helicopter transfers are also available for those who prefer the air, excitement and a speedy journey. 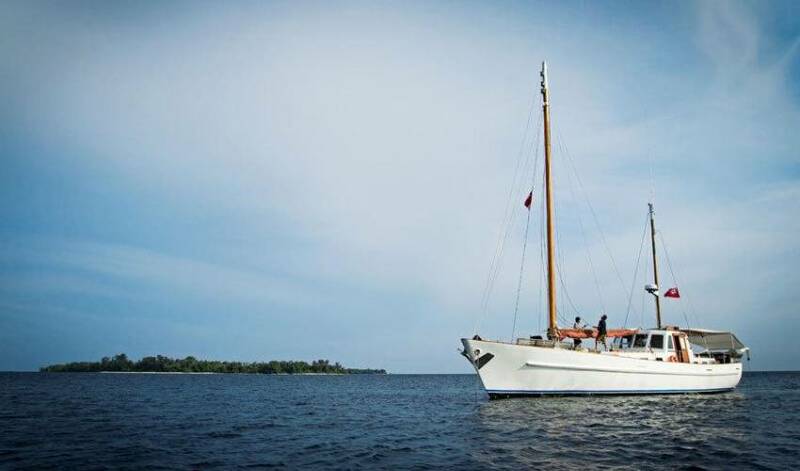 The Island Villa 3363 experience begins at Jakarta's Ancol Marina Harbour, where guests board our 60ft vintage motor sailing yacht the ‘Raden Mas'. The vessel originated from the English town of Cowes on the Isle of Wight, an area synonymous with boat building. 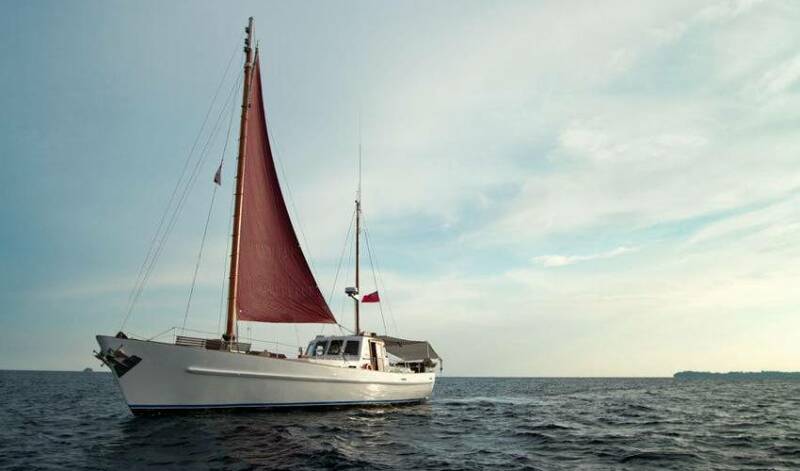 Commissioned over 40 years ago by a British aristocrat, she has been immaculately maintained, with timber decks, brass fittings and four cabins characterized by varnished wooden bulk heads and old world charm. In keeping with her aristocratic roots, when she arrived in Indonesia she was renamed ‘Raden Mas' a Javanese Nobleman's title. If you would prefer a speedy journey via our speedboat or a breathtaking helicopter transfer please contact us for further information. Island Villa 3363is a dream realized by Indonesian antiques aficionado David Salman. David first discovered the island over twenty years ago. 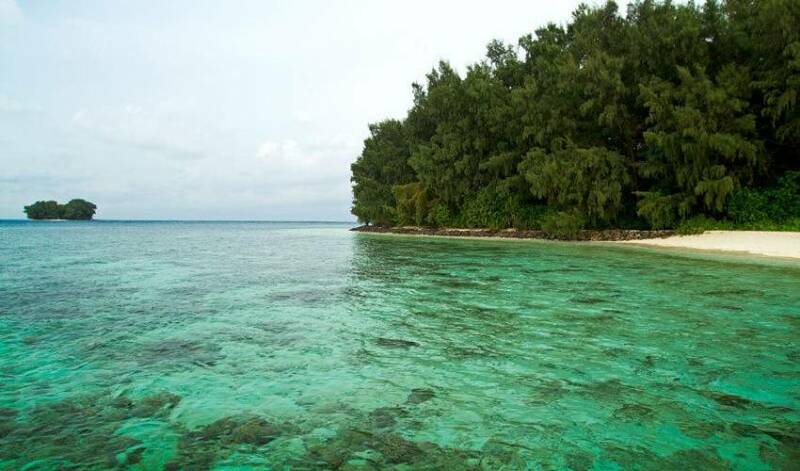 He had leased a simple cabin on a neighboring island and would swim daily across the channel to explore the uninhabited islet. 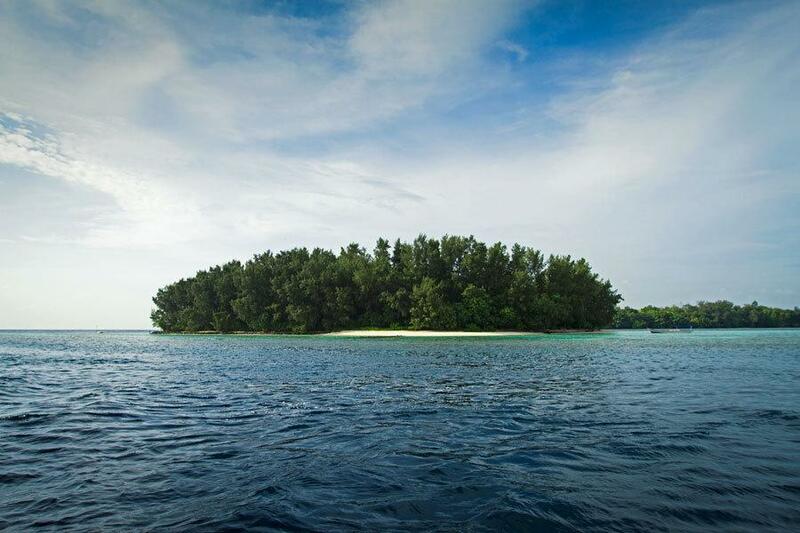 Left unattended for years, the island had lost some of its foliage and had suffered some reef erosion. With a clear vision of restoration in mind, David set about trying to purchase the island, which was clearly not for sale. With characteristic tenacity, he persevered and finally secured Island Villa 3363 two years later. David then set about restoring the delicate ecosystem of the island and it's beaches. There are two channels flowing alongside and the shifting currents, combined with some damage to the reef, had eroded part of the shore. David constructed a natural stone breakwater to prevent currents from damaging the island. On land he planted numerous indigenous trees including pandanas and whistling sea pines known as casuarinas. Both species are resistant to salt-laden breezes and tolerant of sandy soil. In amongst the island's flora, David created meandering sandy pathways that allow you to explore and enjoy all parts of the island. Island Villa 3363's mission is to impact as little as possible on the nature of the island. In construction, we sought to minimize our impact on the environment by using recycled building materials almost exclusively bought locally and using the skills of local craftsmen. Committed to ecologically friendly solutions, a septic tank has been installed as well as a desalination plant to ensure guests can enjoy fresh bathroom water. A natural water treatment system takes wastewater from the showers and washbasins, processes it and recycles it for use in the gardens. We minimize our electricity consumption by using low voltage LED and CFL lighting and limited landscape lighting. We avoid using plastic by using refillable bottles in the bathrooms. We purchase as much organic produce as possible and avoid using processed products and produce basics such as juices and pastries ourselves. All International Passport Holders (non Indonesian) require a passport that is valid with more than six months prior to expiration. Visas are a requirement in Indonesia and, depending on your nationality, you may be required to apply for visa in advance in your home country or may receive a one-month visa on arrival. Please check with the consulate offices in your home country prior to departure. There are plenty of plugs and adaptors (the island is fitted with Indonesian sockets). There are lots of toiletries available such as shampoo, conditioner, shower gel and soap. Hairdryers, sarongs, bathrobes and slippers are available in the suites. Insect repellant is available throughout the island. The island has excellent mobile phone network coverage. What to bring and wear The fantastic thing about renting Island Villa 3363 is that year round sunshine allows you to travel light! 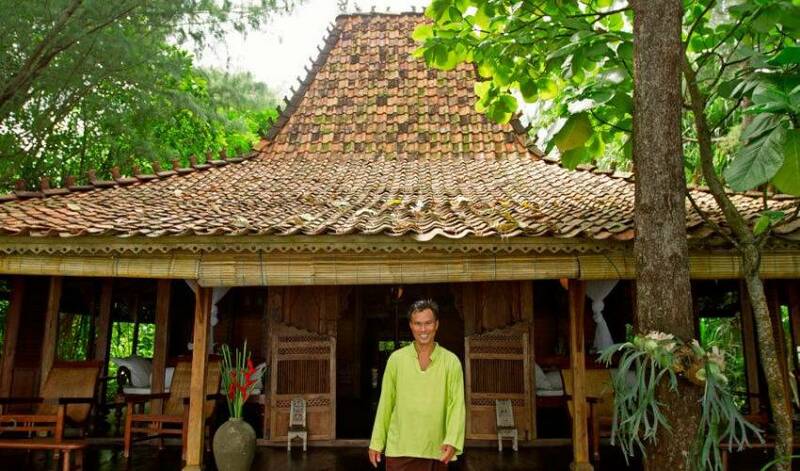 First steps onto Island Villa 3363 reveal a magnificent century old Javanese wooden Joglo house. This ornately hand carved open timber building was created in Central Java and was disassembled piece by piece before being transported to the island where craftsmen restored it to its former glory less than twenty meters from the water's edge. Today the Joglo house serves as the main living area and is also home to two master suites and two bathrooms. The large open atrium has two bedroom suites that are separated from the living area via Dutch colonial screens and Venetian blinds. Perpetual sea breezes whisp through the Joglo making it the perfect spot in which to relax with a book and enjoy turquoise sea views. A semi open hallway leads down to two antique style bathrooms. Century old enamel washbasins, originating from the Old Dutch Planters' Club in Surabaya, now rest upon cast iron stands in the bathrooms. Original taps and showerheads deliver silky soft purified water from the islands desalination plant. The floors are set with antique Javanese floor tiles. High ceilings and open bamboo grills allow for light and ventilation. Island Villa 3363 is a privately hired island for up to 8 adult guests sharing 4 suites. • Island Villa 3363 team of staff including Island Manager, Private Chef, Activities Organizer and Butlers. • Watersports equipment: water skis, kayaks, snorkeling equipment, children's boogie boards, water socks. Island Villa 3363 is non operational during the months of 5th January to 31st March due to monsoon weather. Today's stressful lifestyles demand some time for relaxation, rejuvenation and self-reflection. At Island Villa 3363 we help to create a wellness retreat, which has been tailored for your specific needs prior to arrival. Our minimum stay is three days but we suggest at least week to help bring about lasting life changes. We work with a team of highly qualified yoga instructors, traditional gurus and self-development consultants. Once you arrive at Island Villa 3363, all decisions regarding cuisine are removed. A new menu is created daily to perfectly suit your tastes, based on a survey, which we ask you to fill out prior to your arrival. Special children's menu's can also be provided with prior notification. There are several breathtaking spots around Island Villa 3363 to enjoy fresh island delights. The Bale is a cozy standalone pavilion with cushioned daybeds and traditional serving trays, a place to enjoy meals in relaxed comfort, while listening to the waves lapping against the shoreline. Guests gravitate to this area to enjoy the food sharing banquets prepared by Island Villa 3363 culinary team. Fresh catch of the day, accompanied by a medley of vegetables served on a bed of organic rice or mouthwatering barbeques at sunset. When the chef sounds an old ship's bell dinner is served. If you would prefer a romantic interlude, a table for two at Sunset Point on the beach is guaranteed to alight the romantic in you. Proposals have been made there (and accepted)! For those who want to venture offshore, there are lots of water activities on offer. 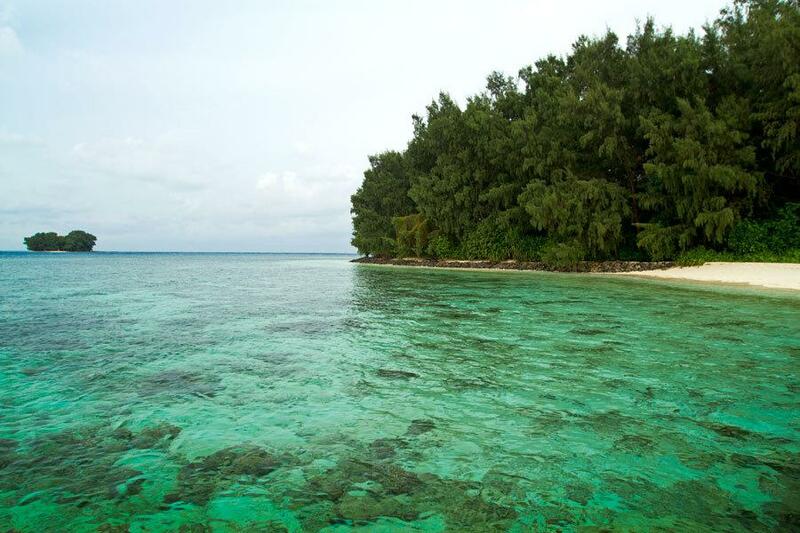 We provide snorkeling equipment for those who want to explore the island's underwater paradise. Kayaks are a great way to enjoy the scenery and visit neighboring islands too. If you're looking for an adrenaline kick then jump into a pair of water ski's and let the captain jet you across the strait or don some scuba gear and explore the reef below. Fishing is also a perfect way to while away the morning and bring back lunch too. We make sure that children are kept well entertained at Island Villa 3363s with our Kid's Activity Manager. They could be out in the water learning about tropical fish or finding pirate treasure onshore. We endeavor to create the most magical island experience. We have a large range of children's DVD's, toys, books and games available. We also have cots, high chairs, baby baths and babysitting services available with prior notification. Guests can pre-order items such as formula and diapers. There are few places on earth more heavenly than Island Villa 3363 to say ‘I do'. 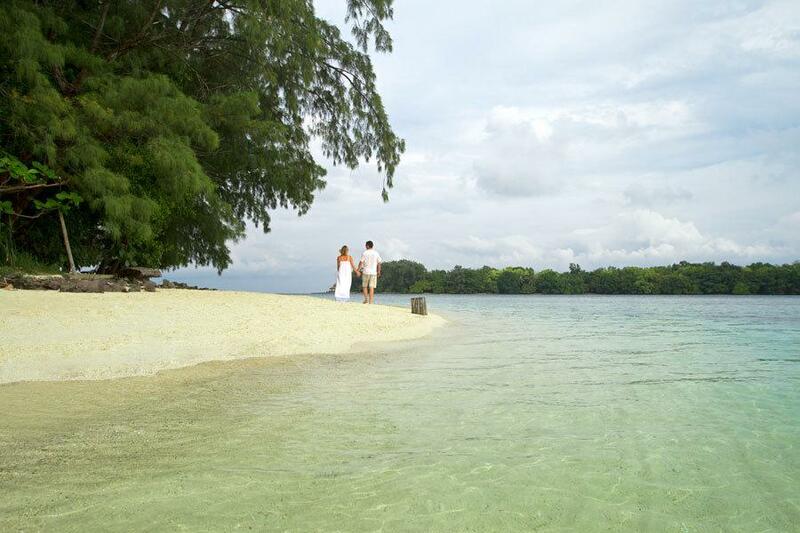 We love to help to create weddings and honeymoons on the island. 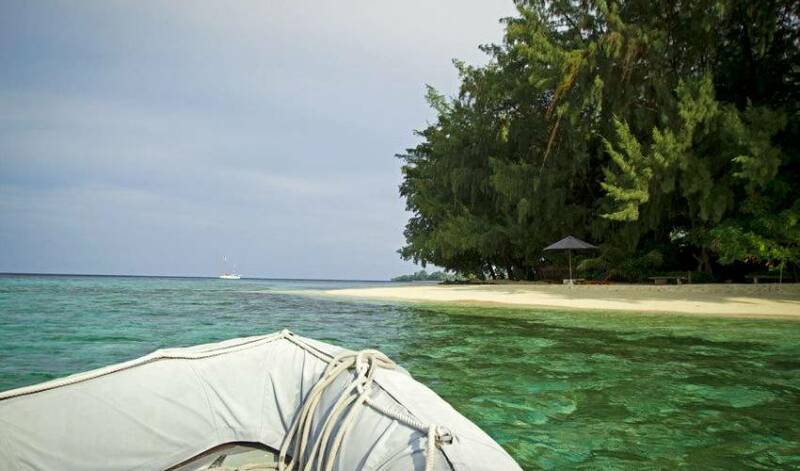 Imagine waking up on your first day of married life on your own private island?